Born in Lincolnshire, England, Michael Francis Gilbert graduated in law from the University of London in 1937, shortly after which he first spent some time teaching at a prep-school which was followed by six years serving with the Royal Horse Artillery. During World War II he was captured following service in North Africa and Italy, and his prisoner-of-war experiences later leading to the writing of the acclaimed novel 'Death in Captivity' in 1952. 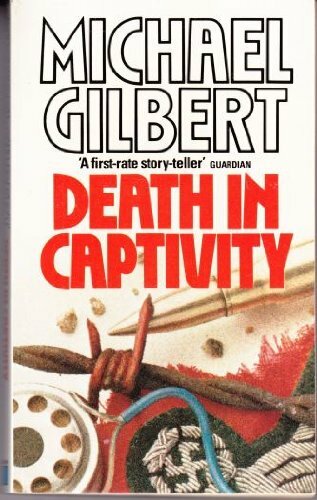 After the war, Gilbert worked as a solicitor in London, but his writing continued throughout his legal career and in addition to novels he wrote stage plays and scripts for radio and television. He is, however, best remembered for his novels, which have been described as witty and meticulously-plotted espionage and police procedural thrillers, but which exemplify realism. HRF Keating stated that 'Smallbone Deceased' was amongst the 100 best crime and mystery books ever published. "The plot," wrote Keating, "is in every way as good as those of Agatha Christie at her best: as neatly dovetailed, as inherently complex yet retaining a decent credibility, and as full of cunningly-suggested red herrings." It featured Chief Inspector Hazlerigg, who went on to appear in later novels and short stories, and another series was built around Patrick Petrella, a London based police constable (later promoted) who was fluent in four languages and had a love for both poetry and fine wine. Other memorable characters around which Gilbert built stories included Calder and Behrens. They are elderly but quite amiable agents, who are nonetheless ruthless and prepared to take on tasks too much at the dirty end of the business for their younger colleagues. They are brought out of retirement periodically upon receiving a bank statement containing a code. Much of Michael Gilbert's writing was done on the train as he travelled from home to his office in London: "I always take a latish train to work," he explained in 1980, "and, of course, I go first class. I have no trouble in writing because I prepare a thorough synopsis beforehand.". After retirement from the law, however, he nevertheless continued and also reviewed for 'The Daily Telegraph', as well as editing 'The Oxford Book of Legal Anecdotes'. Gilbert was appointed CBE in 1980. Generally regarded as 'one of the elder statesmen of the British crime writing fraternity', he was a founder-member of the British Crime Writers' Association and in 1988 he was named a Grand Master by the Mystery Writers of America, before receiving the Lifetime 'Anthony' Achievement award at the 1990 Boucheron in London. Michael Gilbert died in 2006, aged ninety three, and was survived by his wife and their two sons and five daughters.